Here are a few of the questions I get asked most often. I will be adding to this section as more come up. Enjoy! I’m really interested in nutrition. How do I study it? I want to study about food. Can I get a degree in Food Studies? I want to do something to improve the food system, nutritional status, and health. How do I get started? I want to work in food policy. How do I get started? I’m a lawyer. I want to work on food issues. How do I get started? I want to find out what Americans eat. What are the best sources? Do trans fats have anything to do with obesity? Which is better: organic or locally grown? What’s the deal on soy? Is it good or bad for me? Is high fructose corn syrup good, bad, or indifferent to health? Whose nutrition advice can I trust? 1. I’m really interested in nutrition. How do I study it? Clinical Nutritionist: If you would like to work in a hospital or counsel patients about diet and disease, you will need to be credentialed as a Registered Dietitian (RD) and must meet course, degree, and practice requirements of the American Dietetic Association (Journal of the American Dietetic Association). Nutrition scientist: If you want to do research, you will need a science degree of some type. Look for a university with a department of nutrition science or epidemiology and apply for masters or doctoral degree programs (American Journal of Clinical Nutrition, Journal of Nutrition). Public health nutritionist: If you want to work with community groups, government agencies, or international agencies, look for degree programs accredited by or affiliated with the American Public Health Association (Journal of the American Public Health Association, Public Health Nutrition). A privately run website makes this easy for you; it describes accredited programs on one site. Nutrition is a controversial field and credibility is essential. Anyone can claim to be a nutritionist, but to be credible, the more you know about nutrition, the better. Degrees help. I think it’s good to understand as much as you can of the science and its implications for dietary choices. Get a degree of some kind but also read as much and as deeply as you can and form your own conclusions about what you are reading and being told. 2. I want to study about food. Can I get a degree in Food Studies? As recently as ten years ago, I would have had to answer no, but today students who want to learn more about food have several options. New York University, for example, hosts undergraduate, master’s, and doctoral programs in Food Studies with a choice of two areas of focus: Food Culture, which examines the social, economic, cultural, and psychological factors that influence food consumption now and in the past, and a brand new program in Food Systems, which traces commodities and agricultural production from farm to table. Boston University has a master’s program in Gastronomy. So does the University of Adelaide in Australia. And if you want to go to Italy, you can study at the University of Gastronomic Sciences, which grew out of the Slow Food movement. I was responsible for starting the NYU program in 1996 so I am prejudiced in its favor but I have talked to graduates of all of the others and they all have great things to say about whichever one they went to. My conclusion: studying about food is so much fun and so useful that anyplace you can do it will be great. 3. I want to do something to improve the food system, nutritional status, and health. How do I get started? Start by reading a post I did on this topic in 2011. The easiest starting point is to join an organization working on an issue that interests you. In 2011, I posted a list of groups and websites. In August 2012, I posted about such groups and provided a spreadsheet of organizations by category. In June 2012, the Harvard Food Law Society produced a career guide to relevant organizations, also by category. I always recommend joining the Center for Science in the Public Interest (CSPI) because this group has been at it so long, is so extraordinarily good at taking on the major issues, and is independent of food industry funding. At the very least, subscribe to Nutrition Action Healthletter. 4. I want to work in food policy. How do I get started? The easiest way to get involved in food policy is to start doing it. If you want to work locally, find a group in your area that is working on the food policy issue that most interests you. There are groups working constantly on food assistance programs, farmers’ markets, food deserts, school food, community gardens, school gardens, urban agriculture, community food security, locally grown food, agricultural sustainability, organic production, the Farm Bill (see list in 2011 blog post). You can usually identify such groups by an Internet search for “food advocacy” in your area. Or read the Edible magazine published closest to where you live. If you want to work on national food policy issues, you might try an internship at a Washington DC-based advocacy group working in your area of interest. For preparation, it helps to know as much as you can—depth and breadth–about the history of food and nutrition policy in the United States, have a firm grounding in how food policy works at the federal agency level (which agency does what), and how Congress and agencies work to implement policies. Much of this can be learned on the ground if you are working with a group engaged in challenging activities. You can also start by writing well researched letters, op-eds, and position papers since these will force you to know what you are talking about and to think clearly about them. What’s stopping you? Just do it! Michele Simon has similar advice, with some more specifics. 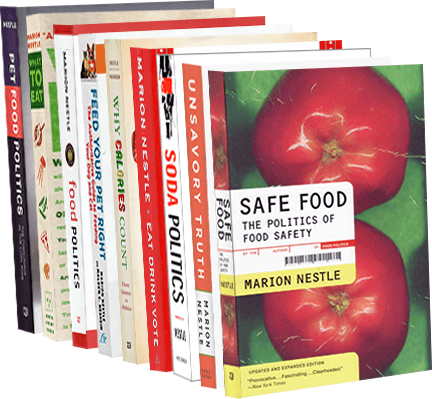 Food Safety News provides a list of private organizations working on food safety issues, as well as public. 5. I’m a lawyer. I want to work on food issues. How do I get started? Lawyers have important roles in promoting healthy food policies, and the more they know about food culture, history, politics, and even taste, the better. Michele Simon discusses career issues on her website in two posts, one for food policy careers in general and one for lawyers in particular. Go for it! 6. I want to find out what Americans eat. What are the best sources? My favorite sources of information about the American food supply come from the USDA. The USDA provides data on the availability (“consumption”) of specific foods and food groups in the food supply from 1909 to the present. These figures are reported as pounds of whatever food it is per capita per day. They represent the amount of that food produced in the U.S for an entire year, less exports, plus imports, divided by the number of people in the population on a given day such as July 1. These are the data that say the per capita availability of calories is 3,900 per day. Because they do not account for wastage and some other factors, they represent an overerestimation of dietary intake. Actual data on dietary intake are reported at the site of What We Eat in America. These figures are self reports by individuals interviewed in dietary intake surveys. Because people tend to lie about (OK, can’t accurately remember) what they eat, these data underestimate actual intake. Self reports say that people eat about 1,800 to 2,200 calories per day, figures much lower than 3,900. The truth undoubtedly lies somewhere in between. And in case you would like to know the nutrient composition of foods, the USDA provides that information at yet another site. 7. Do trans fats have anything to do with obesity? Trans fats raise the risk of heart disease, and that’s why it’s good to have them out of the food supply. Their association with obesity is indirect. They are used in a lot of junk foods because hydrogenation prevents fats from turning rancid. But whatever fats get used to replace trans fats will have the same number of calories. That’s why I wish the FDA would not allow food companies to put “no trans fats” on their package labels. “No trans fats” is a calorie distractor. It makes you think the food is a diet food when, in fact, it has the same amount of calories. One more point on trans fats: if the Nutrition Facts label says zero for trans fats, but the ingredient list mentions partially hydrogenated vegetable oil, it means that the amount of trans fat present is less than one-half gram per serving. Unless you are a big eater of junk food, that shouldn’t matter much. 8. Are organics worth it? I think so. In doing the research for What to Eat, I spent a lot of time asking questions about whether the USDA Certified Organic seal meant anything. I concluded that is most definitely does. It means the producer of the food followed rules established by the USDA Organic Standards Board, and was inspected to make sure the rules were followed. The rules say that fruits and vegetables must not be treated with synthetic pesticides or fertilizers and cannot be genetically modified, irradiated, or fertilized with sewage sludge. Food animals must be fed organic feed, may not be treated with antibiotics or hormones, and must be permitted access to the outdoors. When you choose organics, you are voting with your fork for a planet with fewer pesticides, richer soil, and cleaner water supplies—all better in the long run. With that said, the quality of the rules themselves is highly debatable and there is much political jockeying about whether they are too lax or too stringent. I think they can’t be too stringent if anyone is going to trust them and that much vigilance is required to maintain the highest possible standards for organic production. To stay on top of the issues, consult the Organic Consumers Association (and see the chapters on organics in What to Eat). 9. Which is better: organic or locally grown? My preference is both. When you choose locally grown, you are voting for conservation of fuel resources and the economic viability of local communities, along with freshness and better taste. Whenever I have the choice, my personal priority order is (1) organic and locally grown, (2) either organic or conventional and locally grown, depending on the season, and (3) Conventional (and see the chapters on produce issues in What to Eat). 10. What’s the deal on soy? Is it good or bad for me? I would put it this way: if you are not confused about soy foods, you must not be reading product advertisements or newspaper accounts of research. For every study in my files demonstrating health benefits of soy foods, I have another disputing those benefits. Soybeans are high in good quality protein (meaning that their proteins are similar in amino acid content to those of meat and dairy foods), contain a good balance of carbohydrate and fat, and are loaded with minerals. Enthusiasts say that soy foods protect against practically any disease you can think of. No one food can possibly be that good. Overall, I find the science to be painfully inconsistent. Some studies find benefits, some find none, and others actually suggest that soy foods might cause the very health problems they are believed to prevent. Soybeans contain proteins found to reduce blood cholesterol levels and the risk of heart disease. They also contain isoflavones that behave in the body like weak estrogen (“phytoestrogens”). Although isoflavones work with soy proteins to reduce blood cholesterol levels, they also act like estrogens–and estrogens are known to increase the risk of breast and other cancers in women. As I explain in the soy chapter of What to Eat, the research is so inconsistent that it is difficult to draw conclusions. I can’t make sense of the health debates about soy foods, not least because so much of the research is sponsored by industries with a vested interest in its outcome. My feeling at this point is that soy is a food, not an essential nutrient. Like any food, you can eat it if you like it, but you don’t have to if you don’t. 11. Is high fructose corn syrup good, bad, or indifferent to health? You are probably thinking that high-fructose corn syrup (HFCS) is the new trans fat— something to be avoided at all costs. But HFCS is not poison. It is just sugar in liquid form, differing from common table sugar (sucrose) mainly in how it affects the texture of foods. HFCS, however, is a marker for junk foods. Cheaper than sucrose, it turns up in all kinds of processed foods, particularly soft drinks. And there is nearly as much of it in the food supply as sucrose — 68 pounds per year per person versus 62 pounds for table sugar. Sucrose is a double sugar made of two single sugars — glucose (50 percent) and fructose (50 percent) — stuck together. HFCS also contains glucose and fructose, but the sugars are already separated and their percentages differ slightly. Because sucrose is quickly split by digestive enzymes, the body can hardly tell the two kinds apart. Glucose, by the way, is blood sugar, fructose is fruit sugar, and honey contains both. Fructose — unlike glucose — does not stimulate the release of insulin, and in small amounts can be a useful sweetener for people with diabetes. But fructose is preferentially metabolized to fat, raising the possibility that HFCS — or any other source of fructose (but we won’t worry about fruit) — could have something to do with current obesity trends. Both HFCS and sucrose give us more fructose than we need and for both the advice is the same: eat less. 11.Whose nutrition advice can I trust? I’m always tempted to answer this question with “mine, of course.” I answered it more seriously in a column I wrote for the San Francisco Chronicle (October 11, 2009). I wrote What to Eat to inspire readers to think about nutrition and to figure out for themselves whose advice makes sense and not. I think some healthy skepticism is useful in interpreting anyone’s advice, even mine. Does the expert have a vested interest that might influence opinion? Does the conclusion of a research study completely contradict everything you’ve heard before? Does it announce a breakthrough? If so, you should be seeing caution signs everywhere. A lot of nutrition is plain common sense. Use it!